I love the flexibility offered with digital files, and I love seeing the projects and fun things my clients create with the files from our photo sessions. But I know there are some of you out there who might feel a little stuck. You have these great photos, but you don't know what to do with them or what to use them for. You can print and frame them. You can make a photo book. But there are so many other ways to use photos of your family. I'm hoping this blog series will inspire you to get that USB drive or disc out and get those photos out where you can see and enjoy them! We've done Valentine photos every year since G-Man was little. I started taking the photos because I wanted to use them for valentines. A couple years ago, I realized I had built up a little collection of Valentine's Day photos, and in an effort to make our house look less bare after all the Christmas decorations get put away, I started printing and using those photos as decor during the month of February. The kids love seeing the photos and pointing out how funny some of them are and how much they've changed over the years. And I firmly believe that using the faces of the people you love as the art in your home has a huge effect on their confidence and feelings of self-worth. Seeing their photos at the top of where their hearts were displayed helped both kids know which hearts were theirs. It was so sweet watching G-Man read his hearts on the wall every couple of days and then trying to read his sister's hearts to her as she ran in circles around the kitchen. Do you have a lot of pictures based around one holiday sitting on your hard drive? Extra frames you could spray paint red and put photos of the people you love in them? 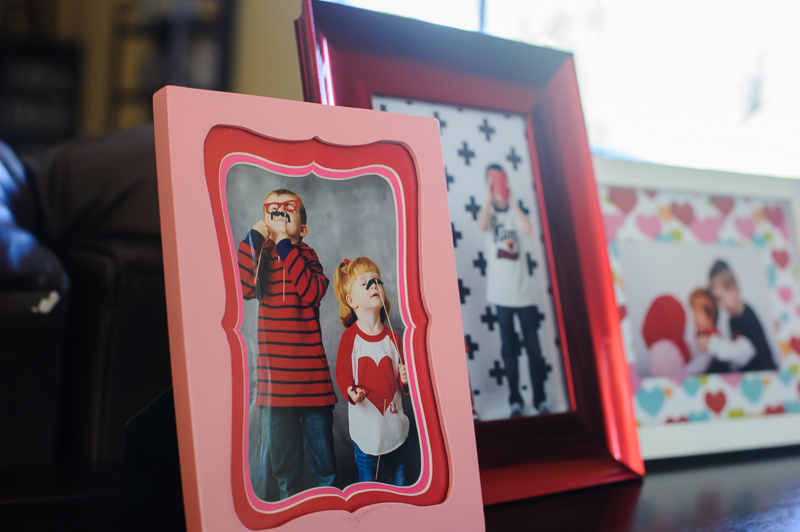 Have you seen Valentine's Day frames on clearance and wondered what on earth people would use them for? Start planning to decorate your home with the people you love during the month of love! * If you've come up with a fun way to use or display photos of your family or kids and are willing to share with other clients and blog readers, please send me an email and let me know! I'd love to feature your ideas!